Perusing Planet Four: Ridges Talk I came across the image below. I thought I’d say more about it in case you encounter similar types of images. What drew my eye was the large diffuse lighter streaker on the one side of the crater. That’s called a wind streak. Wind streaks have been found not only on Mars but also on Venus and Earth. As their name implies, they are formed directly by the interactions of the surface wind with the soil. The wind is impacted by obstacles in its path on the surface like crater rims. As the wind moves around the crater rim either picks up dust particles pushing them together collecting them to create bright streaks visible from orbit or the wind excavates material exposing a darker material than the surrounding top surface layer. Wind streaks extend into into the direction the wind is moving towards, so they are also good indicators of past wind direction. 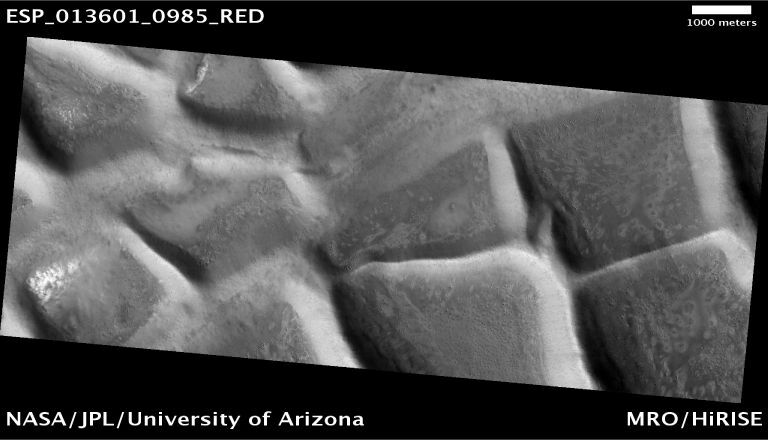 In the Spring, the sunrise heralds changes on the Martian ice: In the Spring, a P4 classifier’s fancy lightly turns to thoughts of —-SUBLIMATION!. Add your own verses in the comments or on Talk. WeMartians is a brand new podcast aimed to engage the public in the exploration of Mars. The latest episode is about citizen science on Mars with Michael talking about Planet Four and Planet Four: Terrains. Listen to Michael (and cameos of other familiar Zooniverse voices) below or on the WeMartians website. Yesterday marked a decade since Mars Reconnaissance Orbiter (MRO) went into orbit around the Red Planet. A few months later science observations commenced, and since then the mission has been studying the Martian surface and atmosphere. 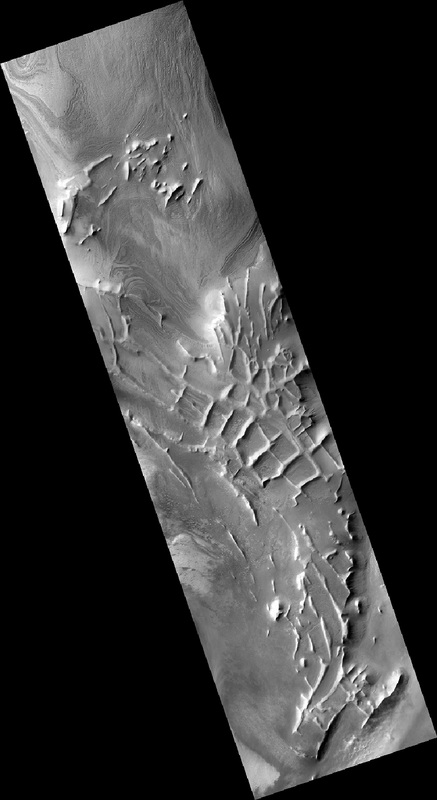 We use MRO data on both Planet Four (HiRISE [HIgh Resolution Imaging Science Experiment] images) and Planet Four: Terrains (Context Camera [CTX] images). Thanks to the contributions of those at NASA and the instrument teams (including engineers, scientists, software programmers, and other operations support team members) who make these observations happen and keep the spacecraft and its suite of instruments happy and healthy. 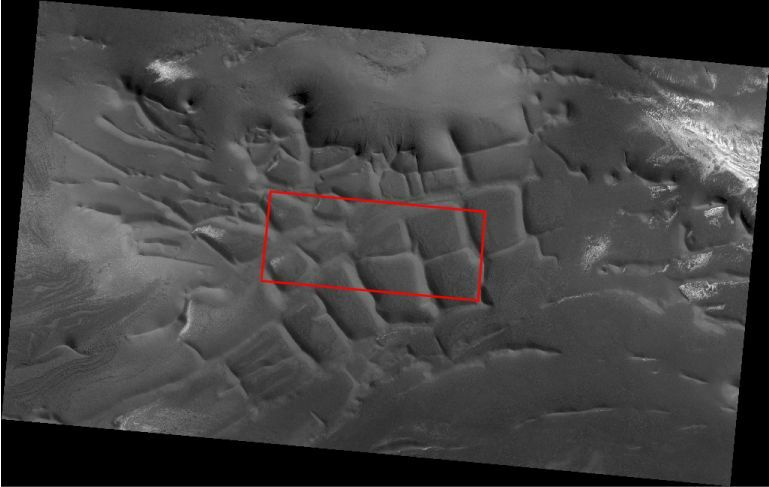 With 10 Earth years (or ~5 Mars years) of observations, we can look for long term changes in the geyser formation process, and this summer we’ll be pointing HiRISE to new regions of the South Pole thanks to the contributions from Planet Four: Terrains volunteers for monitoring for several more Mars years. Below is a highlight reel compiled by NASA of MRO’s greatest science hits and images over the last decade. There have been so many iconic moments from the MRO’s mission, but I think two moments are HIRISE capturing the descent stage of the the Curiosity rover with the parachute and the parachute of the Phoenix lander several years before. Wake up early and view our planetary neighbors in all their glory. Starting this weekend you’ll be able to find Mars and four other planets from our Solar System visible in the early morning sky. In addition to the Red Planet, this planetary alignment includes Mercury, Venus, Jupiter, and Saturn. Some of the planets will continue be visible for over two or three weeks, but the best time to see all five is from Saturday, January 23 through the first week of February. Below is a guide to help direct you to the right spot. Just before dawn (about 45 minutes before) while the sky is is still dark will be the best time to look. Most of the planets are bright compared to stars in the sky so you should be able to glimpse them without the need of a telescope or binoculars, though you’ll likely need binoculars to spot tiny Mercury. If you’re having trouble identifying the planets from the backgrounds stars in the patch of sky, this (below) might help. Mars should stand out as it will have a reddish tint thanks to all the iron oxide dust (or maybe better to say rusty dust) that covers it surface and swirls in its atmosphere. The bright star Spica will be in the middle between Jupiter and Mars, but our own Moon will also join this cosmic display, so if you’re having a hard time finding the planets, then try on the morning around February 1st. That’s when our Moon will be visible near Mars. You can find more details on how to spot this early morning show here and here. If you do spot Mars, take a moment to think about the fact that you’re viewing a world that you can help better understand how the atmosphere/climate of this distant world works. You can explore Mars and help map seasonal fans on the South Pole of Mars with the Zooniverse’s Planet Four project ( http://www.planetfour.org), and if you do get a glimpse of Mars, post your photos in the comments section and we’ll post them here in a future blog post. Thanks to Talk moderator Andy (wassock), we have a handy map that overlays previous plots I’ve made of the locations of the HiRISE images being focused on by Planet Four and the CTX images that are being searched on Planet Four: Terrains. He’s also marked some of the target of interest areas like Ithaca, Inca City, Manhattan, and Giza that we’ve been trying to focus on over the past two years on Planet Four. Andy overlays the plot on top of the geologic map of the Martian South Pole produced by the United States Geological Survey that’s been discussed on Planet Four: Terrains Talk. You can find more details about it here. Dust Devil Tracks or a Jackson Pollock Painting? You might have seen an image like the one above while classifying on Planet Four: Terrains. It reminds me of Jackson Pollock’s painting style. Those dark lines crisscrossing the image are actually dust devil tracks. Dust devils are mini-tornadoes on the surface of Mars, kicking up and clearing dust in their paths. Dust devils exist in the plains and deserts on Earth. The Martian equivalent can be considerably bigger than those found on Earth. Their tracks can be seen from orbit in images from CTX and other cameras. Here’s what dust devils look like from orbit. This image was captured by the HiRISE camera on Mars Reconnaissance Orbiter. Dust devils have been caught in the act on the ground in the mid-latitudes by several robotic rovers and landers including the Mars Exploration Rovers (Opportunity and Spirit). Actually Spirit and Opportunity have had dust devils pass over them, cleaning their solar panels. Below was a series of dust devils passing through nearby the Spirit rover in Gusev crater. You might be wondering why we don’t ask you to mark these in the main Planet Four: Terrains interface. The reason is because they’re so ubiquitous that a full map of their locations isn’t needed, but if you’re interested you can identify images like this on Talk using the #dustdeviltracks hashtag. Thanks to volunteer o0ohando0o for spotting this image and posting about it on Planet Four: Terrains Talk. You can find more examples of dust devil tracks as well as other things you might encounter in the Planet Four: Terrains images in our Site Guide. We see high resolution non-map projected color mosaic images of the Martian South Pole from HiRISE, but with the Context Camera (On Planet Four: Terrains we show the diced up CTX images), you can get a wide view perspective. 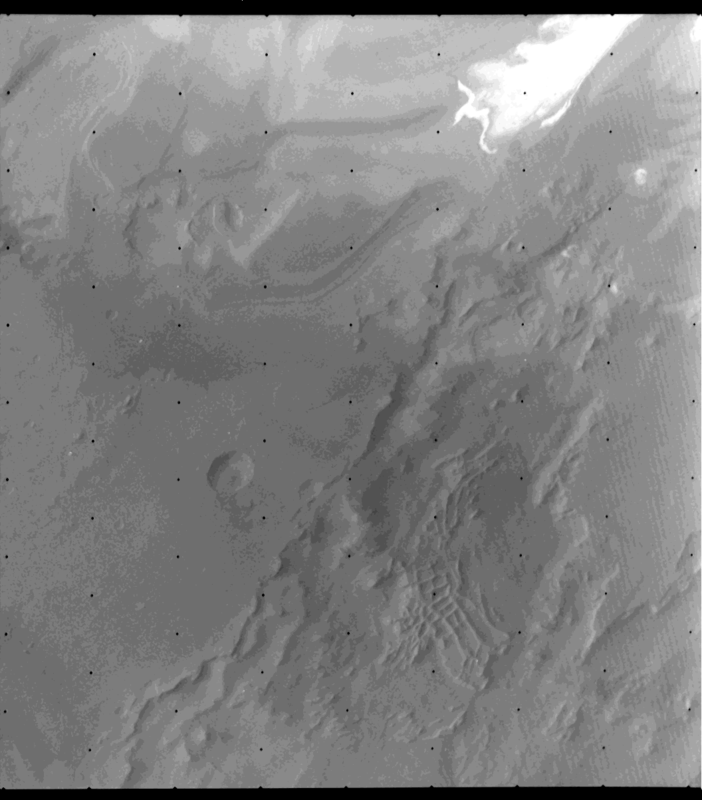 This is the main drive of Planet Four: Terrains, to use the wide-field Context Camera (CTX) images to find new areas of interest that we can then explore and study in detail. On the original Planet Four, we’ve spent a lot of time over the past two years focusing on the region informally known as ‘Inca City.’ With CTX can you can get a bird’s eye view of Inca City and its structure. Check out the image below. 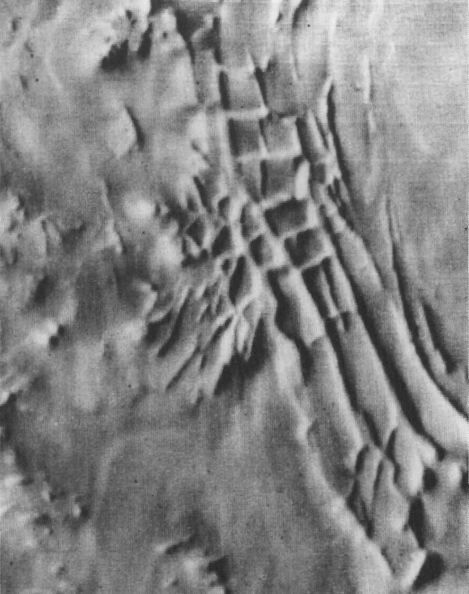 You’ll notice the unique pattern of interconnecting rectilinear ridges that the region is known for.